This value play can be purchased for around $377 in 2011 from reputable online authrized dealers. It's also 60Hz and 720p like most of these value pieces. The value oriented 32BX320 is not trying to blow you away with its looks. Like last years EX400 series LED, it is pretty sharp looking until you get up close and notice some of the more "plastic" feaures (both figurative and literal.) If having the hottest looking, thinnest depth metallic chrome bezel framing is important to you, this is not your TV. This is the slightly more upgraded model to the BX320 listed above. It has 1080p (1920 X 1080) resolution as it's main upgrade but still maintains most of the other features. Is it worth the extra $100 over it's counterpart. You may want to glance at our article below about these resolution differences to decide. Some of Vizio's offereings are hard to beat and this is a compelling value TV. We performed a full review of it this spring. It's your basic 60Hz, 720p flourescent LCD unit with excellent pricing around $319 from some online dealers. Here's a caption from our review: "HD picture was of course much better. Color information was more saturated and the edges of images clean and sharp. 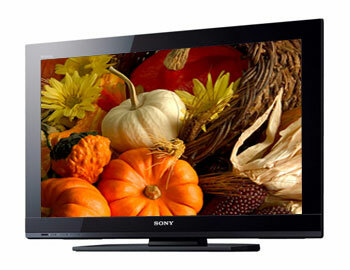 The LCD panel is good with glare but also provides a flat picture appearance compared to better plasma and LED-LCD TVs. Viewing angles are a very pleasant surprise. There was very slight degradation of black levels and contrast from side views but not extreme at all. This is very impressive result for an LCD TV especially in this size category." Though it has CCFL backlighting this Panasonic entry has 1080p resolution and Panasonic's newest Alpha panel technology used in the LED backlit versions. That should make for better black levels and brightness than most CCFL fluorescent TVs. We've found the unit for as low as $419 from some of our authorized merchants. We performed a full review of this entry and it proved its worth for sure. It can be purchased for a mere $339 from some of our authorized dealers online. Here's a caption from the review about picture performance: "Picture performance was much better in HD through HDMI input. Colors had more pop. There is still some slight blurring from judder effects when slowly panning. Overall, we did not see much if any improvement from last years C450 series. As with most LCD TVs with an anti glare screen rather than a clear screen the picture depth is lacking overall. Picture presentation is somewhat flat."